INDIANAPOLIS – For a record 149 laps, cars raced around the Indianapolis Motor Speedway unimpeded and in an orderly manner. But once the first yellow flag fell on lap 150, the 48th Running of the Indianapolis 500 became exciting – complete with a NASCAR-style red flag with nine laps left to give fans a classic finish. One year removed from missing out on a shot at an Indy 500 win due to a late yellow flag, Ryan Hunter-Reay crossed the Yard of Bricks a mere 6/100th of a second ahead of a hard charging Helio Castroneves to earn his first drink of milk in the IMS victory circle. In the process, the Florida native became the first American to win the Greatest Spectacle in Racing since Sam Hornish, Jr. in 2006 – a seven-year dry spell for Team USA. Hunter-Reay, driving the No. 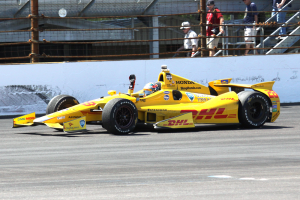 28 DHL car for Andretti Autosport, held off three-time Indy 500 winner Helio Castroneves by a hair-raising .0600 of a second – the second-closest margin of victory in the history of the event – in a five-lap shootout to claim victory. Marco Andretti finished .3171 of a second back for his third third-place finish in nine starts. 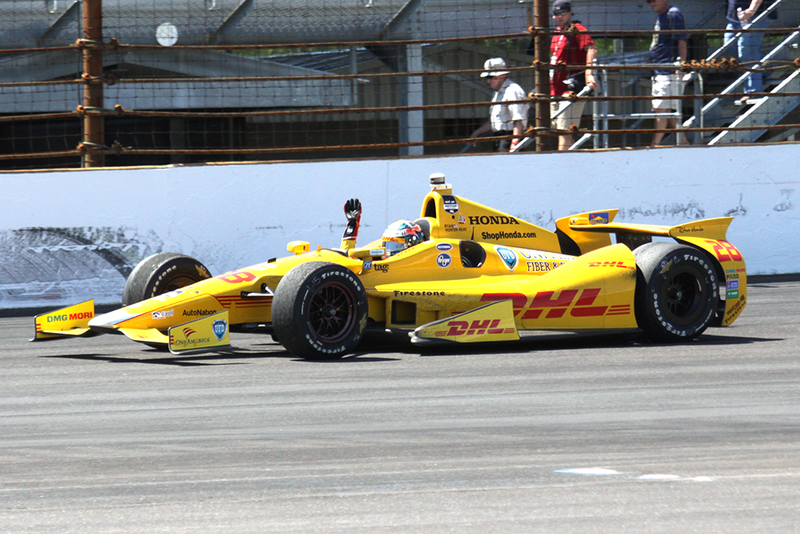 Hunter-Reay started 19th and roared to the front early in the race, claiming his first lead at lap 100. Altogether, there were 34 lead changes among 11 drivers. Following the red flag, the first at Indy for a crash in 50 years, Hunter-Reay led lap 195, Castroneves gained control on the next lap only to lose it back to Hunter-Reay on laps 197 and 198. Castroneves grabbed the reins again, only to lose it coming off the fourth turn as both drivers approached the white flag (.0235 second lead at the white flag for RHR). Castroneves made a late move coming down the final front stretch, but Hunter-Reay held him off by a little more than a car length. Marco Andretti finished .3171 of a second back for his third third-place finish in nine starts. After the race, Andretti said he was almost taken out by the race winner. Carlos Munoz, who finished second last year as a rookie, finished fourth driving for Andretti. 2000 Indy 500 winner Juan Pablo Montoya was fifth after his run through NASCAR, and current NASCAR superstar Kurt Busch placed sixth in his first Indy car race. Busch left the track by helicopter and raced in the Coca-Cola 600. Race officials red-flagged the race on Lap 192 for seven minutes to fix the turn two SAFER Barrier and clean up from the single-car incident involving Townsend Bell’s No. 6 Robert Graham KV Racing Technology entry. Bell had been running fifth, less than two seconds behind the race winner. Pole-sitter and Indianapolis native Ed Carpenter’s day ended when he was sandwiched between Bell and James Hinchcliffe in turn one on lap 176. He was running in the top four at the time. The first caution flag flew on Lap 150 when the No. 83 car driven by Charlie Kimball made light contact with the SAFER Barrier in turn two. The record for longest stretch before a first yellow flag had previously been set at 65 laps in 2000. The four yellow flags tied the record for fewest (1990). Graham Rahal was the first to retire from the race with an electrical issue in the No. 15 entry. Tony Kanaan, who won the race in 2013, developed an early suspension issue and finished 26th. This entry was posted in Indy 500. Bookmark the permalink.